Fall premier is here, all the stations are strutting their stuff, What are your favorites this season and what do you think just are not going to make it? I'm looking forward to the premier of Dexter, season 4, on Showtime. It's this Sunday, the 27th. Never watched it until this past summer when Comcast offered to give me Showtime for free so I wouldn't quit their cable service. Watched all 3 seasons in the last couple months and it's a really good show. It's already been picked up for a 5th season so i'm not worried it'll get the ax. Really, really looking forward to the premier. Other than that, just happy The Daily Show and The Colbert Report are back from vacation. BSG is done, True Blood and Flight of the Conchords aired over the spring/summer so they don't count but they're both faves of mine. Hockey starts back up, football is underway. ESPN2 shows Football/Soccer quite a bit late nights (Go Man. U.). Not sure about South Park but I think they may be starting up too. Oh, and Curb Your Enthusiasm is back! Love that show. House was a blast. I can't wait for Chuck. Ummm...Witches of Eastwick was okay, but I really liked the movie back in the day. Oh...Fringe! Love that show. Entourage is still goin I believe. True Blood, but as Banjer mentioned it's done for the season. I like Weeds as well. The Daily show, if it will be aired here, which would be nice. Look at it this way, the Cubs will win as many postseason games this year as they did the last two years. But yeah, the Cardinals should clinch the division tonight. I think they have a good shot at their 11th World Series title. As for non-sports TV shows, I guess Mythbusters is the only one. I don't watch network TV. The only shows I try not to miss are Mythbusters, The Universe, and Anthony Bourdain: No Reservations. I just watched the first episode of Ken Burns' The National Parks: America's Best Idea on PBS. Episode 2 is tomorrow and apparently they'll all be online starting tomorrow. It's as much about the people behind the parks as it is about the parks themselves. The first episode is basically a biography of John Muir. He was an interesting man to say the least. At Yosemite, he would climb to the tops of trees during storms to "feel what the tree felt." Thx for the heads up, I'd heard about that documentary but completely forgot it was about to air. Will be checking it out for sure. Ken Burns and his staff do great work. I still have to buckle down and convert "Baseball" from VHS to DVD. Ya know, the one thing i hate about this Digital TV switchover is not getting PnP. Kinda suks! Prolly exciting for all 3 people that are hockey fans here, the NHL season is about to start and the Red Wings are opening the season in Sweden against the Blues. Hockeytown east considering the Wings' lineup. 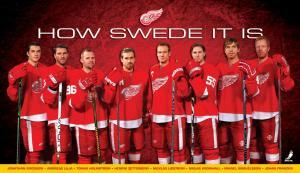 Samuelsson is gone but the rest are still here. Heroes, Lost (in January i believe) and the office are my main three. Also Flash Forward looked pretty good this past thursday. OHH and Detroit Basketball and hockey, and Michigan state Football, basketball and hockey.. I can't wait! Edited by bizketman101, 29 September 2009 - 08:28 PM.